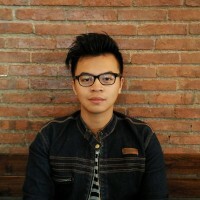 I'm a Creative Designer and Video Artist based in Surabaya, Indonesia. I have been working in Creative Industry for 5 years. I graduated as bachelor of design from Sepuluh Nopember Institute of Technology. I worked as Creative Designer in Kreavi Indonesia, Azaria Enterprise Event Organizer, and i've been working in many projects as a freelancer for years. Experienced as a Director, Director of Photography, and Editor in filming short movies, commercials, music and promo videos.